Studies indicate that more than 200,000 injuries to the mouth and jaw and over 5 million teeth are lost yearly from sports-related injuries. One answer to this situation is using a mouth guard when a danger to teeth and mouth is present. Safety is a concern when children and adults participate in sporting activities, but when should you wear protective gear for your mouth? Anyone who plays contact sports including football, soccer, boxing, basketball, and others should consider using a mouth guard to reduce the chances of damage. What many do not think of is that those engaged in non-contact sports like gymnastics, skateboarding, rollerblading, and mountain biking might want to wear this gear as well. The obvious advantage of using a mouth guard is to limit the mouth-related injuries to the participant’s lips, tongue, and soft tissues in the mouth. Mouth guards may help avoid chipped or broken teeth or loss of teeth as well. Remember that a bit of preventative planning can save money, time, and teeth! What is an Under Armour Mouthguard? 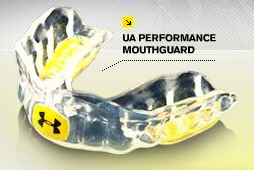 Under Armour's custom-fit mouthwear are the most technologically advanced mouthpieces available. They have been specially developed for strength and endurance, greatly reducing pressure on your jaw from clenching your teeth during physical activity. What are the benefits of Under Armour Mouthguards? Improved Airflow: Under Armour mouthwear allows for increased airflow, making it easier to breathe during strenuous physical activity. The enlarged airway openings also lead to less lactic acid build up. Improved Protection: Under Armour performance mouthguards reduce the impact of blows to the jaw by up to 20%, keeping you safer and preventing concussions. Improved Performance: The patented ArmourBite technology prevents your teeth from clenching and relieves pressure. This allows your body to shift its energy from your mouth to where it is needed: making you perform better!